From January 1977 to September 1978 I lived with my family on an island in the South Pacific – Kwajalein in the Marshall Islands. The island is a military base, and my husband Bob managed a military-funded program there. We had a slow and easy life on the island, filled with all kinds of beach and water activities. 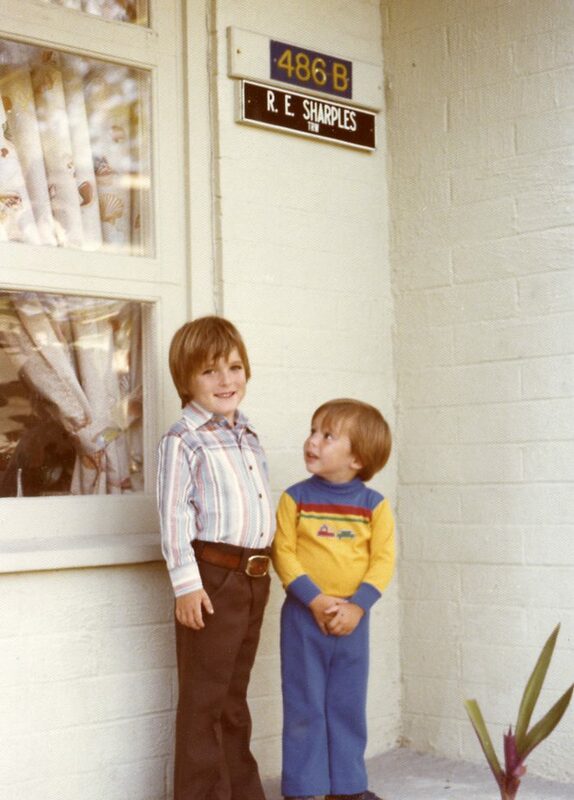 When we arrived our sons Paul was five and Ben was two and a half. When we left Paul was seven and Ben four. Ben was glad to leave; Paul could have stayed forever. However, when we first stepped off the plane (a military carrier with no windows) I wanted to be any place but there. I had had to take a leave of absence from my job at the same company where my husband worked, so on Kwajalein I was a stay-at-home mom for the first time. It took me six months to learn to love and accept my life of leisure. Still I had plenty of things to keep me busy: playing tennis every weekday morning after taking the boys to Kindergarten and preschool, running, going to the beach or the pool with the boys in the afternoons, snorkeling, taking Yoga classes, painting and doing needlework, volunteering at the preschool, going to the boys’ t-ball games, managing the Micronesian handicraft shop, taking a course in Cobol programming, teaching a children’s art class, vacationing in Micronesia and Hawaii, and entertaining several dozen people at small dinners and large parties in our home. Only 3000 people lived on this small island – only three-quarters of a mile wide and a mile and a half long, and we became quite close with the people Bob worked with and many of the other families from other companies. We are still connected with many of them to this day. Being on the island also was the beginning of my writing days. I got up early with Bob, and after he left by bicycle for the flight that would take him to another island for his work, I wrote in my journal until the boys woke up. That writing resulted in my first published piece – an article about our life on the island for my company magazine. Eventually the day came to leave. With shell and flower leis draped around our necks we drove off to the airport – one of the few times we traveled in a van on Kwajalein rather than by bicycle. Across the street many, many friends – Bob’s work colleagues, our social friends on the island, my tennis buddies, and our Marshallese house keepers – were waiting under a tree we called “Yum Yum,” for a familiar ritual to bid us goodbye with champagne in hand. They had come to say “Yukwe Yuk,” sort of like saying “Shalom” in Marshallese. I was happy and sad as we boarded the same military airplane for the states. Leaving Kwajalein is such a final thing. I never got used to that finality. Madeline Sharples is the author of Leaving the Hall Light On: A Mother’s Memoir of Living with Her Son’s Bipolar Disorder and Surviving His Suicide – in poetry and prose (Dream of Things) and co-author of Blue-Collar Women: Trailblazing Women Take on Men-Only Jobs (New Horizon Press). She co-edited The Great American Poetry Show Volumes 1, 2, and 3 and wrote the poetry for The Emerging Goddess photography book (Paul Blieden, photographer). 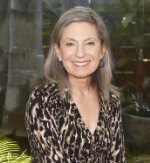 Her articles appear at Naturally Savvy and Aging Bodies and on her blog, Choices [madelinesharples.com]. She is currently working on a novel. We’ve lived next door to Sherry and her husband, Dave, for over twenty years, and she was always a person I avoided. Bob sometimes played racquetball with Dave, but I have never wanted to get socially involved with her. Even at Bob’s hint that they were wine lovers like us, I wasn’t interested. I had always found her too loud – I could hear her yelling at Dave, her stepson, or their son, Steve, through both our exterior walls; too nosy – she always seemed to poke her nose outside whenever I was out in the garden; too domineering, and much too pushy. I couldn’t believe her chutzpah when she appeared at our door with her oldest daughter and a six-pack of beer as soon as she found out we had two young, handsome, male houseguests – my nephew and his friend – staying with us for a few weeks. That was the end of my patience. But it all changed the day Paul died. She offered to put up out-of-town relatives, she brought over bagels and cream cheese in the morning, and she supplied the coffee for the open house after the funeral. She was there with calls and flowers and kind words,. The word “suicide” didn’t make her back off. One night, right before the first Thanksgiving after Paul’s death, Sherry left a basket on my doorstep. Her note said that she dreaded the holidays after her mother died, so she gathered – “harvested” was the word she used – a few things to ease the holiday season for me. As I read her note and looked through the basket, I cried, not only out of the dread of being without Paul on Thanksgiving, Hanukah, and his New Year’s Eve birthday, but for the generosity and caring of a person I hardly knew. In such a quiet and unassuming way, she showed me real human compassion and understanding. She never needed to ask me a lot of questions, and she didn’t intrude on my privacy. She just let me know she was there for me if I needed her. Among the items inside – each one separately wrapped – was a book about coping with the loss of a love – unlike most others. This one was in poetry – she knew I wrote poetry – and the first book I was able to concentrate on enough to read through after Paul died. She also included a journal, a sweet smelling candle, a box of absolutely delicious chocolate covered graham crackers, and a smooth gray stone. This stone became my biggest comfort. Just large enough to fit in the palm of my hand, it feels the perfect size when I close my hand around it. One edge is round and the other is triangular. One side is plain; the other has the word “son” carved into it. Right after Sherry left the basket on my doorstep, my little stone became my nighttime friend. I soon got into the habit of going to bed with it. Once settled, I held it on my chest between my breasts. I liked its coldness on my aching heart. It helped me relax. Holding it in my hand and reading the word with my thumb also helped. I carried it around in my pocket for a while. I wanted to feel that it there for me. Then, I began to wonder about my own sanity. Was I trying to exchange my son for a stone? When I got more together and began to feel better, I let go of it and let it rest on another item from that basket – a little, silk-covered, sachet pillow that smells like lavender. It has hand-painted butterflies and the word “heal” printed on the silk. They are still there on my bedside table after all these years. Madeline also produced a CD of her son’s music called Paul Sharples at the Piano, as a fundraiser to help erase the stigma of mental illness and prevent suicide, her mission since the death of her son in 1999. I wake at 6 and get ready to go to the gym. I negotiate the huge and blinding sun as I drive east. I work out on the elliptical trainer and lift some weights and then go on to the grocery store. By this time it is sunny–much clearer and cooler than usual in southern California at this time of the year. I have a lot on my plate so I rush home to eat breakfast, shower, and change. Then I go to my office. The stickie reminders on my desktop overwhelm me. I need to finish two website articles, write a poem for Robert Lee Brewer’s November Poem A Day Chapbook Challenge, and do my regular marketing and blogging work. Today I also work as a volunteer administrator on Facebook’s Putting a Face on Suicide (PAFOS) page from noon until 8:00 pm. Though I feel good about doing this volunteer job, it takes a toll on my emotions. PAFOS, a memorial page, provides education and comfort to survivors by creating personal tribute pages featuring their loved ones. Its objective is to collect 99 photos of people who have died by suicide for each day of the year. As of this writing PAFOS has 1750 faces and is on Day 18 of our 365-day project. PAFOS also creates commemorative posters and a video for each day. My son Paul is part of the Day 4 video. His music plays in the background. My job is to either Like or respond to every comment posted. Though I’m still able to do my writing work while volunteering, I check back every few minutes so I can respond quickly. I need to keep minding the store. I’m overcome by all the young faces on the PAFOS page–a 15-year old girl, and boys 18, 21, 16, 17, and 19. A few older faces are also there. It’s either the anniversary of their death or their birthday, each date lovingly remembered by PAFOS staff. While I look at these faces, I can’t help wondering what makes these people take their lives. How do the young ones even know how to do it? I also have another challenge. Someone leaves a message that she would just like to talk. Unfortunately that’s not our job. I explain I’m a survivor and volunteer, not a therapist. I suggest, if she is in trouble or distress, that she contact the National Hope Line Network 1-800 784-2433 (SUICIDE). She thanks me. I still worry about her. My son was diagnosed with bipolar disorder when he was 21, and he took his life at 27. Ever since I’ve worked to remember him and help erase the stigma of mental illness and suicide. I also find writing a way to heal. I turned to writing during his illness. 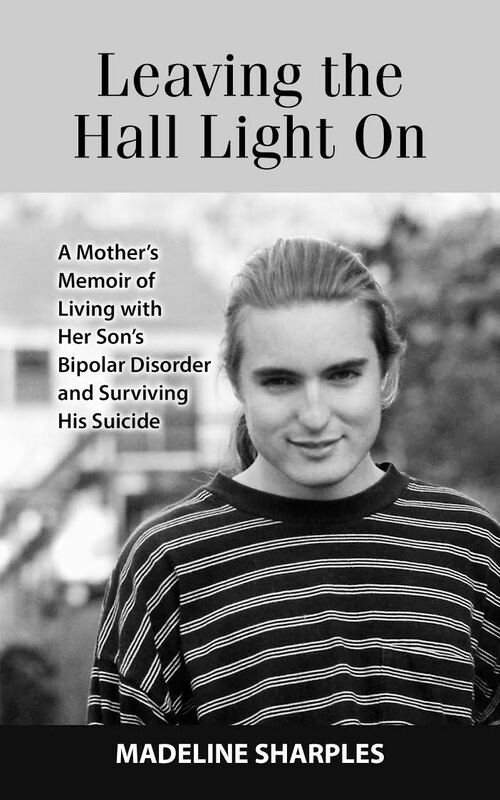 A few years after his suicide I created a memoir, Leaving the Hall Light On (Dream of Things, 2012), in hopes that others will find it useful in surviving their own tragedies. Madeline is the author of Leaving the Hall Light On: A Mother’s Memoir of Living with Her Son’s Bipolar Disorder and Surviving His Suicide (Dream of Things) and Blue-Collar Women: Trailblazing Women Take on Men-Only Jobs (New Horizon Press). She co-edited The Great American Poetry Show and wrote poetry for The Emerging Goddess photography book.